Keep in mind, this does not include additional renewable resources such as wind or solar. Add up those percentages and you’ve got 4.08 trillion kilowatt hours (kWh) of electricity generated at utility-scale facilities in the United States. NOTE: Utility-scale facilities are power plants with at least one megawatt of capacity. To put that into scale, one kilowatt could charge 278 cell phones. Four trillion kWh translates into 14,388,489,208.6 charges; AKA more cell phones than you can go through in 100 lifetimes since the average smartphone battery endures 300-500 charging cycles. We digress – that’s a lot of energy to supply across the nation. While most individuals remain relatively unconcerned or unaware of the life cycle management of power plants, there are a handful of individuals who eat, sleep and breathe operational excellence to extend the life and service of power generating facilities. You’re aware of the importance of keeping up with maintenance on your car so you can (mostly) avoid any serious problems that may leave you stranded on the side of the road in the wrong part of town, right? Right. Being proactive instead of reactive can save you thousands of dollars and a massive headache. In comparison, power plants also need to factor in scheduled maintenance cycles in order to avoid emergency shutdowns which could result in lost revenues and lost minds. This heavily impacts life cycle performance. Reactivity in the form of emergency shutdowns exposes the potential for compromised safety or quality in order to expeditiously mitigate the situation. Proactivity in the form of scheduled shutdowns can be multi-phased and can allow for operational efficiency. These efficiencies include, but are not limited to, labor costs, improved reliability and alternative means of generation during downtime. For those of you reading this who are unfamiliar with the process, you might ask yourself, when is a good time to schedule a facility outage? Planned outages are timed around demand peaks. These peaks occur in the summer and winter when heating and cooling is in full swing. That means the individuals who are responsible for overseeing operations and maintenance are left with two seasons for upgrades; the spring and fall. These outages are extremely important to the health of the plant. While some plants are flexible in meeting peak demand, such as hydro facilities, others must plan for such intervals. The trick is to complete said maintenance faster without compromising safety or quality. On average, the typical shutdown can take up to two months to complete. During this time, certain protocols must be followed depending on the type of work and area of the plant. Those are some hefty obstacles to overcome if you run over schedule. Luckily, there are solutions to keep you as far away from turmoil as you can get. 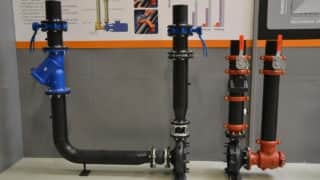 Victaulic Construction Piping Services (CPS), in conjunction with grooved mechanical pipe joining systems, can reduce your project lifecycle by one half. Don’t believe us? The CPS team will provide you with time studies, BOM change outs and even weight reductions. Ignorance is no longer bliss. The moral of the story – DON’T get caught with your plants down. It detracts from the greater good and your bottom line.